The natural landscape has always been a powerful focus of my work. Currently I am conducting on-site research at local prairies, depicting the landscape in paint. Prairies have been reduced to isolated fragments that require conservation and preservation. Less than 1% of the presettlement tall grass prairie remains. Macro and microenvironments fill my paintings, engaging the viewer in their detail. Even while painting tranquil scenes, I achieve active color sensations by layering color over complementary underpaintings. My paintings express delicate sensations through subtle texture and natural pattern. The tall grass prairie is an irreplaceable tapestry of plant and animal life. I paint dynamic compositions of Midwest prairie remnants so that the viewer can appreciate and see the need of their preservation before they are lost forever. I was born in Ashcroft, British Columbia, Canada in 1958 and became a naturalized US citizen in 1999. I graduated from Marshalltown, IA High School in 1976. I received my BA from the University of Northern Iowa in Art Education in 1980. I completed my MA from Western Illinois in 1999. I taught Art in the Davenport School District from 1980- 2013. I now teach acrylic painting classes at the Figge Art Museum. Please upgrade to a supported browser. 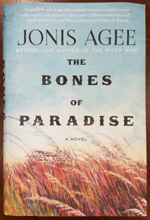 My painting "October Evening" is the cover art for award-winning author Jonis Agee in her novel "The Bones of Paradise". © 1985 - 2019 Pam Ohnemus. All right reserved.